I know, I’ve made a few pies lately. But see how these are different? I mean, come on. Could you resist? I sure couldn’t. Which explains why I don’t have a picture of these all plated nicely, snuggling with ice cream. We ate them before I had a chance to think about pictures. This is why I had leftover dough for that impromptu dinner. Although this recipe is a little time consuming, it’s no harder than making any sort of real pie. It still involves slicing fruit. 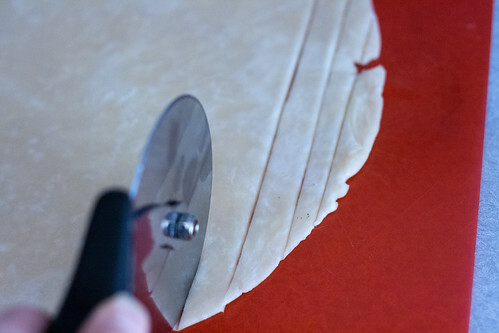 Rolling out crust and making it look pretty. Mixing fruit and sugar and cornstarch. And taking bites with your eyes closed so you can focus solely on each flavor. Please give these a try. They’ll impress your friends for sure. And if you don’t want to share, I won’t tell. Core an apple, then use a melon baller or knife to hollow out the apple more, being careful not to go all the way through the skin. Make sure you save all the apple bits! 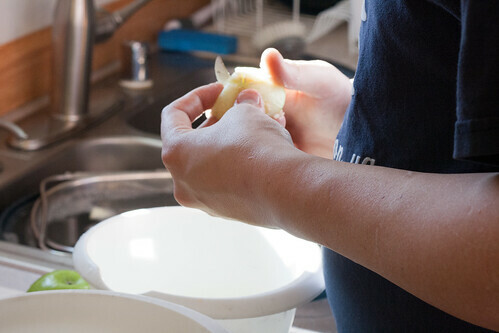 Once the apple is hollow, submerge it briefly in the citrus water to keep it from browning too quickly. Turn the apple over to drain. Repeat this process with all the apples. 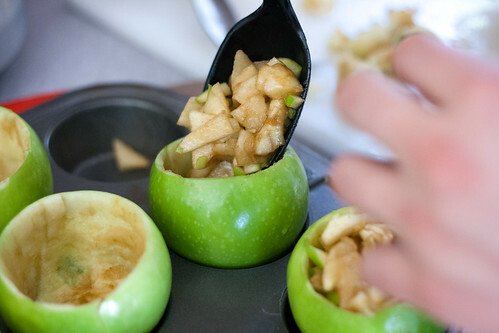 Slice the apple bits into smaller bits, and then mix them with the sugars, cinnamon, cardamom (optional) and cornstarch. Place the hollowed out apples in a muffin tin. This will keep them from tipping during the baking process. 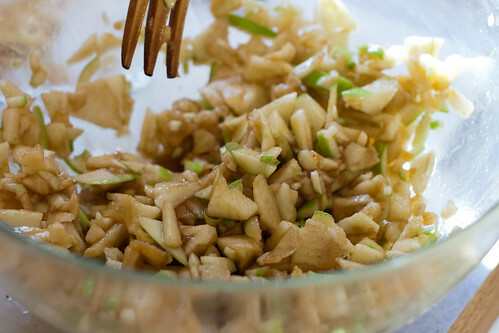 Fill each apple with the bit mixture. 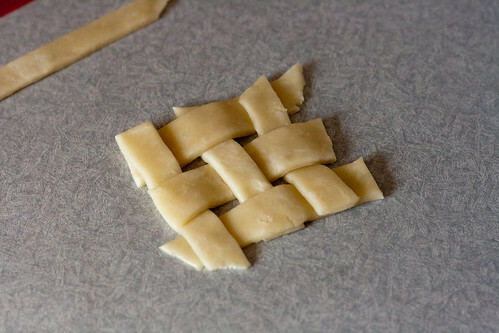 Take the long strips of pie dough and cut them into 4 inch strips. Then “weave” the strips together to create the square tops. (See this photo for reference) Place one square over each apple. Brush the dough with melted butter and sprinkle sugar over the top. Bake for 30-35 minutes (until the dough is fully baked and the apples reach the desired tenderness). 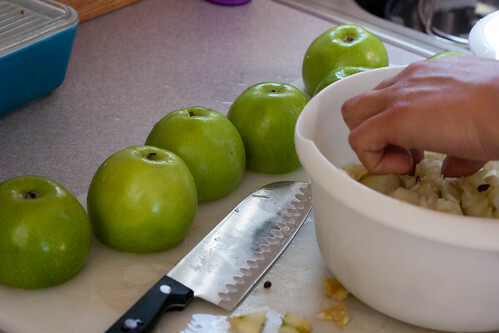 Once the apples have cooled, you can use a fork or spoon to remove them from the muffin pan. Serve with ice cream or a drizzle of caramel. these look phenomenal. Have you considered adding a little Goat Cheese? I’m a big apple-with-cheese kind of guy. but maybe I’m just insane. um maybe cream cheese? yum. These are so awesomely cute! And very yummy looking. well aren’t these the cutest…will definitely be trying them soon! Wow, there is some work in those. They do look lovely though. How cute! But I eat pie for the crust…….need more crust!!! We can share. I eat the filling and leave the crust. Yo Jo! I’m lovin this… I need to go apple shopping! You just keep getting pinned!! Love!! OMGSH! they look so yummy! :p I saw this in this anime called LilPri haha 🙂 this is so cute! Delicious! I’ll try your recipe…thanks for sharing! what a great idea, thanks for sharing! its such a fantastic way to serve apple pie with out the inevitable mess of the pie plate. they are so cute! Wow~ These look awesome! I would have never thought of doing this! Eek, Im so excited to make these for my family! Thanks a ton! Hey Jo! Its great to meet you through Molly and know there’s another food blogger hanging around Missoula! 🙂 I love your site and all your creative recipes! This recipe is so much fun…who woulda thought? You–obviously. I am also really digging that brie recipe. Looking forward to seeing what else you’ve got up your sleeve! 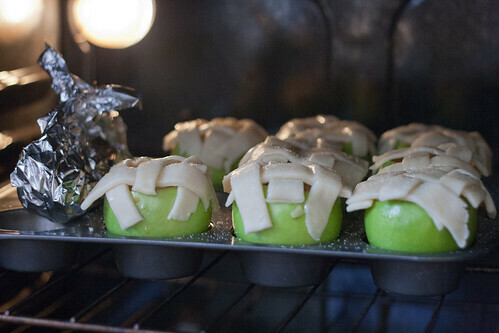 What a really great idea for baking apples! Wonderful! These would be great for a summertime holiday! I am bookmarking for July 4th if I can wait that long! Oh, definitely make them before July. Then you can make them again! This looking yummie. Nice preparation but it will take more times. 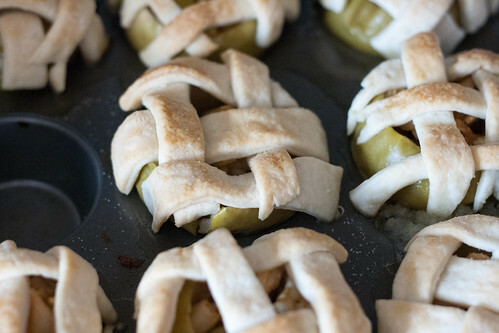 your apple pies are so adorable, brilliant little idea which surely would impress anybody. I ll surely give it a like! 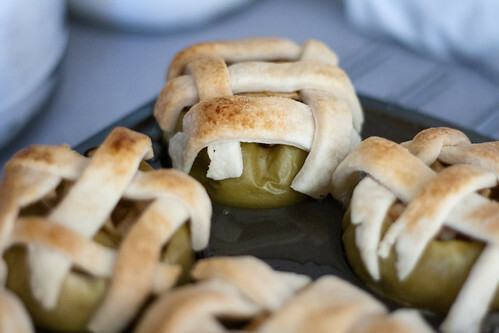 These apple pies are the cutest thing I have seen! I don’t know about you but I wish I had the time to bake them. However if any of you (our lovely readers) do end up making them feel free to submit your photos! It looks delicious! Great idea! Do you grease the muffin tin before putting the apples in? Jo Hello, just wanted to say, I enjoyed this blog post. It was great. Keep on posting! Jo Hi there, just wanted to say, I enjoyed this post. It was practical. Keep on posting! What a great idea for something to take to a party. dallop of fresh whipped cream!…Easy…fun & loved …ps..great as left over for breakfast!!! THANKS FOR THIS !!! TOOO FUN!!!! I’m going to try this with finely chopped walnuts and splenda! I have a feeling you won’t be disappointed. Just made them. So good. How would I store the leftovers? I would just suggest storing them in an air-tight container in the fridge. We haven’t ended up with leftovers yet, so I’m not sure how well they’ll keep. Let me know how it goes! How good are these?! Very imagine. Going to try these tomorrow with a coffee. Thanks! They taste even better. you may want to put the pictures in order next time….it looks like you did everything backwards. This was just so incredibly clever, an’t wait to check out the rest of your blog! Thanks! I hope you try the recipes! awesome recipe..can we make it with red apple also. Absolutely! Whatever apples are available will be delicious. can i make these the day before and re-heat before thanksgiving tomorrow? You could definitely put them together the day before, but I wouldn’t recommend baking them until the day of. Just give them an extra spray of lemon juice, and then leave them covered in the refrigerator until your oven is free. If you start them when you take the turkey out of the oven, you should have plenty of time to bake and cool them before everyone’s ready for dessert. These look deliciously amazing, and super simple…I will have to make these soon! I have seen these on Pinterest they look yummy!! Reblogged this on ❤Happy Baby Dreams|Lucky Elephant❤. So so so awesome! Cannot wait to try this! How ingenious! This looks so yummy! I’ve tried grilled apple, granola, all atop some nonfat Greek yogurt, drizzled with Agave Nectar…another healthier option for desserts! Made these today, so yummy!! Yummmmmmm! You must be a great baker! I wish I could do what you could in the kitchen. I could serve these apples to drunk people in the party bus to sober them up at the end of a party night. I don’t see anyone declining something as wonderful as this!